I don't believe this is a glitch, so I'm posting this in the general Pokemon Discussion section instead. If it turns out it is a glitch, feel free to move it. 2. The announcer is missing at least two phrases. I noticed it immediately because one of them was always really satisfying to hear, and... he never says it in the version of the game I'm playing. In the cartridge I had a long time ago, he did. The two phrases I'm referring to are "Taken down on the word go!" and "There's been major action already!". I'mma cite Werster's newly-uploaded Pokemon Stadium speedrun since it's what reminded me. You can hear both of the mentioned phrases at 3:03 to 3:13 or so. There may actually be more as well, but these two are the ones I recognized immediately being missing. Glad there's a video handy, because when I first realized they were missing, I thought I was just going insane or something. I've never heard anything about this, which is why I'm so curious. It seems to funny to just add phrases in later copies (? I'm assuming later since Jynx's design was changed) of the game. Just for more variety, I guess...? Please note that this did not happen to me and there is, of course, no real proof that the person is telling the truth or not but it doesn't seem that far fetched and I found it rather interesting (especially since there aren't many known XY glitches as it is), so I thought I'd make a topic about it to see what you guys have to say. I wanted to play Pokemon X after a long hiatus and I turned it on. legendary birds but they flee before I could even attempt to catch them. ever head of this happening or has it happened to them? Out of curiosity I asked them if just one of the birds appeared or all three, and they said that they all appeared, not just whichever one s/he should have gotten based on whatever starter s/he picked at the beginning of the game. Hi, my apologies if this is in the wrong place or has been discussed before. I'm not actually sure whether or not this is truly a glitch but since every other percentage before XY was 1/8192 I figured it may be appropriate to post it in the glitch section. Has anyone else ever heard anything about this? I have heard people mention that it seems shinies are slightly more common in Crystal but never anything more than a "oh, hey, maybe they are more common or something". I just found it rather interesting. Hopefully you guys do too and if it is true perhaps someone knows the reasoning behind this? Thanks. Non-Core Game Glitch Discussion / Phantom Dittos in Pokemon Stadium 2? For some reason, every box except for Box 1 is filled with these freaky, level 100 Dittos named 9999999999. All of them have PokeRus as well. They aren't holding anything as you can see from the picture. None of them are shiny. 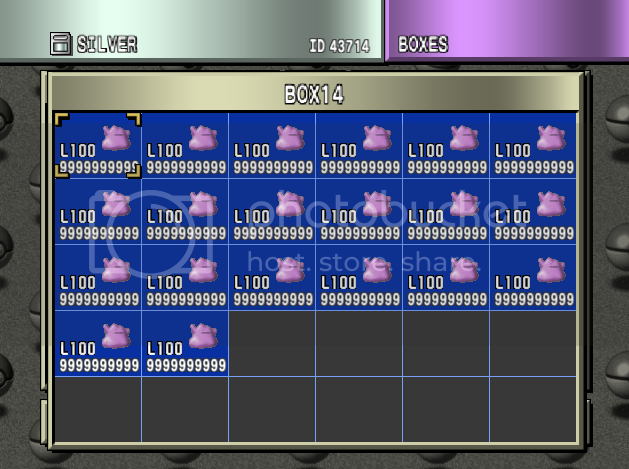 Also, when I load up Silver and check the boxes on the actual game and not on Stadium 2, there are no Dittos. I haven't tried placing anything in the other boxes but I will edit my post when I do. I'm sorry if this has been reported before, but I have never seen it anywhere else. Thanks! Generation III Glitch Discussion / Fire Red Glitch - New or Old? While I was playing around with codes, I had Walk Through Walls on and went through the Cycling Rode building, but silly me, I forgot I didn't have a bike, but instead of "Excuse Me!" I was greeted by the screen shaking and... this. Also, choosing something and then exiting it will cause the screen to stay black and freeze. Very minor, but... I'm just wondering, why DOES this happen? Feel free to call me an idiot if this has been discussed before.